On a cold Valentine’s evening, in a room above a pub where the old sash windows didn’t quite close, I heard Katherine Pierpoint and John Gallas read poetry. The week before, I went to the University of Kent to hear Katharine Norbury read from The Fish Ladder, her superb memoir, which was one of my favourite reads of 2015. What links all three, and got me thinking, is that travelling inspires their writing. Katherine Pierpoint talked about winning a Somerset Maugham Award, which had to be spent on travelling, then read some poems, and recounted some tales, from her trips to India and Egypt. John Gallas – well, he just keeps moving, and the poems he read ranged from New Zealand to The Alphabet of Ugly Animals, which he wrote after seeing an exhibition at the Turner Contemporary, Margate. He has also worked on a book of translated poems from around the world, The Song Atlas, and read one from Tanzania. Katharine Norbury walked and walked from the sea to the source of water. Will Self, he’s another one: walking, walking; writing, writing. And I wondered if there was something missing from my experiences, from my writing, because I haven’t been very far at all. My writing came from enforced inactivity. It started a year into my illness, at a time where I hardly left the house. Journeys were short, and the I was only able to be away from the house for an hour or two. This is still the case, sixteen years on. I haven’t spent a night away from home in a year. I nearly did – to go away to a wedding – but I crashed the day before, and knew I couldn’t make the journey. Yesterday, I went on a short trip alone. A ten minute walk to the station, a train ride of less than half an hour, and a wander round Rochester, where I used to live. It’s familiar, yet changing. The shops change ownership, a cafe where I used to write every Sunday morning has changed names twice since I moved away, and has knocked through to the next shop. Even the railway station has moved a few hundred yards from the old one, which stands strangely empty as we roll towards the new one, the waiting rooms and shelters levelled, just a sign saying ‘Do Not Alight Here’. I am not alone often when I go out, but felt the need to undertake this bold expedition by myself. I notice things more when I am not in company. 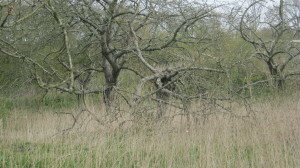 The wild orchards that border the track between Newington and Rainham; the passenger waiting on the platform in a thick puffa jacket, glasses tinted black on a bitterly cold day; a little girl in the next toilet stall with her mum, telling on Leah, who had ‘pulled all the tissue out and just thrown it on the floor, and that was a waste of tissue, wasn’t in Nanna?’ Nanna was in the next stall along from her. The small child in the Oxfam shop, who declared she was going to ‘inspect stuff’: ‘Hmm, this a very comfy chair’. How different the Cathedral looks from the platform of the new station, the perspex and metal shelters on the opposite platform obscuring the view. How cold the fingers of my right hand, texting my husband to ask him to pick me up at the station on the way home. At the weekend, I’d heard Guy Garvey on the radio, at the BBC 6 Music festival, talking about living in New York for a year, and how being away had fed his songwriting. Again, the importance of travel to an artist. I listened to Guy Garvey’s solo album on my iPod on the way back from Rochester. I’d heard it a few times at home, whilst on my computer, my phone, reading, talking to my husband. I hadn’t really heard it at all. On the train, it was just me and Guy and the music, and staring out of the train window. Perhaps it’s being alone that creates the experience, and travelling doesn’t need to be that far. My orchard poems, on Wandering Words, and new ones being written, started when I felt bereft after finishing my story collection. I wrote about what I could see from the window of my writing shed, as a filler-in thing, till the next writing project found me. They became that project. Like the shops and cafes of Rochester, the orchards are changing, disappearing. Here is a new poem – or perhaps two, about the boats that are docked on the orchard that backs on to our garden. On a car ride from Faversham to home, I was shocked to see that most of an old cherry orchard had been chopped down; the second such orchard that has disappeared in the last two years. Last summer, we bought cherries from a stall in that orchard. A young woman was selling them, her toddler in a playpen under a tree, and a babe in arms, just ten days old. We asked what kind of cherries we bought each time – Napoleon Biggereau, Sunburst, Merton Glory. We bought some on the very last day the stall was open, on my way to an event where I read my poem ‘Know your cherries’. I used them as a prop, then shared them with my granddaughter. She accepted them silently, seriously, while the other poets read. The juice dripped down her chin. A man goes to see his parish priest in rural Ireland during the ‘hungry years’ of the 1930s or 40s. The man has too many children; he cannot feed them all. He travels to work in England and sends money back home, and still there is not enough money. He asks the priest if there is anything the church can do to help. The man’s eldest child comes home from school a few days later to find that some of her siblings have been sent to an orphanage, several miles away. An extreme example of help, of charity, gone badly wrong. I have not ever been in such extreme need, but there have been times when money has been short, I have been (and am) too sick to work, and things have seemed grim. The state has provided, through welfare benefits. I have been able to keep my home and to feed my children at times when I feared I would lose everything. The generosity of others has also been both a lifesaver in emergencies, and has added some colour to a very black and white existence. When funds are low, it can be difficult to keep hold of your dignity. And pride can get in the way of accepting offers of help. How that help is offered, in a way that allows a person to accept or reject offers, and so that it does not appear patronising or pitying, is very important. Here are a few good examples from my own experience. I have a friend who has offered me loans over the years. I have often declined, sometimes accepted. In a recent emergency, I asked if the offer still holds, and she happily sent a cheque with a cheery note saying that there was no rush to pay it back. She has also given me money in the past, a small amount to pay an unexpected bill, for example. It has never affected our friendship. I have paid back loans, or gratefully accepted funds given. Some years ago, a friend took me with her on a day trip to France. It was close to Christmas, and she knew that I had very little money to buy presents for my children. We stopped at a service station on the way home, and she turned to me with an idea for a gift that my children would love, and would make a big difference to our household. ‘I have a mad money fund,’ she said. ‘It’s for money I don’t really need, but it’s for splurging on treats. I’d like to give you enough to buy a Freeview box.’ She would give me the money on condition that I didn’t tell my children where it came from; the gift would be from me. My children may be reading this now, and this will be the first time I have made them aware of this act of kindness. It was done in a way that preserved my dignity, and literally it added a little colour to a pretty basic existence at that time. And my children, big as they were at the time, squealed with delight when they opened the gift. I have friends who invite me to lunch and lightly say it’s their treat. People who will buy a drink knowing that I cannot buy one in return. They know that funds are low, or that I just need cheering up. I am writing this today because some people performed what they saw as an act of love, an act of kindness. It was done without asking, arrived unannounced, and although this was not their intention, it has offended my dignity. It feels like an act of charity, pity even, not an act of love. Love is not something you do at people, it has to be with their consent. I still love those people, but I do feel that my wishes have not been considered. Life has been difficult recently, things feel out of control. People in my position need to feel that they have some control over what happens in their lives, to be given choices. Going back to man who went to the parish priest at the beginning of this post. That man was my grandfather. His eldest child was my mother. Things done in the name of charity can be wonderful, can give people an element of control over their own destinies, can help people get back on their feet during hard times. Or they can be like what happened to my granddad, to my mother, to her brothers and sisters who were sent away. The school hall was wood-panelled, with one wall adorned with the names of past head girls, a list of gold-leafed lettering. There were high windows along one side, and a stage with a table and a high-backed chair where Miss Collins, the headmistress, sat during morning assembly. At one time, I knew how many wood panels lined each wall, how many windows and windowpanes there were in the hall. I knew because I counted them every day. Counting was a way to keep me safe. There was a lot to be anxious about back then – not only homework, exams and the ups and downs of friendships, but also that I did not always feel safe at home. Counting was, and is, a bit like stepping on the cracks in the pavement. Terrible things might happen if I didn’t count or if I failed to step over the cracks. Today is the first day of October. My first words were to the cat, who has developed a habit of pulling her water bowl into the middle of the kitchen floor, for me to kick or trip over as I walk through to the bathroom without turning the light on, so I don’t wake up too much, giving me a chance of getting back to sleep after the 5 o’clock wake up. I may have sworn. I neglected to leap out of bed saying, ‘White rabbits, white rabbits, white rabbits’, which would have protected me from anything bad happening this month. There is, however, still time for ‘Pinch, punch, first of the month,’ which might just cancel out the bad luck. We all have rules, routines to keep us safe. Some of us take this to greater lengths than others. I’m not claiming to have OCD. I would not belittle those that are slaves to their compulsions. But sometimes my obsessions become too much to handle. At times of distress, the counting takes over. I add up the numbers on car registration plates, the digits in dates. If they add up to multiples of 5 they are good. 21 and 22 are also safe numbers. Today, 01/10/2015, is a safe day, a good day. I count the number of letters in newspaper headlines. I can calculate quite fast. During very bad times, I add up the number of letters in sentences I hear spoken, seeing the words in my head. My head can be a very busy place. It’s no wonder I have trouble sleeping, relaxing, with so much counting to do. When I was very ill, with severe anxiety and depression, I was advised to use scheduling. This is a method whereby you plan what you will do in a day, even as simple as ‘have breakfast, shower, get dressed, clear breakfast dishes, listen to radio, try to step outside the front door.’ The last of these was because I was terrified of everything, including leaving the house and staying in the house. Scheduling imposed structure and rules that were more helpful than my personal rule of counting everything. If I did get to step outside, I would feel like I had achieved something. I was told that if I kept doing it, taking small steps, that eventually it would not be so hard, I could get back to doing some of the things that I used to enjoy. Support was a factor in this recovery. I used to think that I had to do everything myself, a belief built on having a shaky start in life, where I wasn’t kept safe or made to feel safe. I learnt that a few good friends were pleased to take me out for very short outings, to take me home again if I started to panic. I have another good rule, one I invented myself. I call it internet-free Sunday. I’ve been practising it for the past three years, I think. I shut down my laptop by six o’clock on a Saturday (I also have a daily curfew on internet use – none in the evenings), and don’t open it again until Monday morning. It’s a break from mental overload, from always being available, from the temptation to check if there are any more Likes on my most recent witty Facebook status. It’s how Sundays used to be, only less boring. I guess the point of this post is that rules can be tyrants or liberators. And that even the good rules are made to be broken. I once had a text from my son-in-law, suggesting that I might want to break internet-free Sunday to see a video of my granddaughter having her first taste of solid food. That was a good enough reason to break my internet fast early. I’ve been counting a lot in the last couple of weeks. It’s one of those times when one bad thing after another has piled on. Sometimes bad things happen in spite of counting, in spite of it being a good date, numerically. I don’t feel in control of some of the things that are going on. The counting has not helped. Writing has. Writing has saved my life many, many times. My notebook is my friend. I can tell it anything – it does not judge, it doesn’t say I’m overreacting or being silly. It doesn’t tell me to pull myself together or to look on the bright side. As I fill the pages, I feel the tension leaving my body for a while. I feel ready to face the world. I am sure that readers of this post will have advice for me – mindfulness, walking (yes, that does work for me), keeping my chin up. The chin up thing worked for me yesterday. I had been trying to regain control. Exhausted from lack of sleep, from feeling tense all the time, from the goddamned usual symptoms of chronic illness, I stepped outside into the garden and looked up. A buzzard was hovering overhead. I see buzzards from time to time in our area. I like to think it’s the same bird I see each time. It reminded me of the last time I saw it, just a couple of weeks ago. It was a beautifully warm September day, dragonflies were flitting over the vegetable patch, three sunflowers were nodding their yellow heads at the edge of the garden. My husband Bob had lifted up our granddaughter so that she could see the sunflowers close up. She was running around on the grass, wearing Bob’s sun hat. The day was already perfect, and then I saw the buzzard flying over the orchard that backs on to our garden. It made my heart soar. Seeing the buzzard again, yesterday, brought me back to that perfect day, reminded me that happiness is not so far away, even when things seem bleak, unresolvable. New year’s resolutions: unrealistic promises to yourself made to be broken, or a way to kickstart your plans for the year? I gave up on them a few years ago. The dark days of January are no time for donning the hair shirt of deprivation. But I do use planning tools, and make commitments to my creative life throughout the year. The last of these is no longer relevant for me, as it was tied to Julia Cameron in The Artist’s Way telling me to do this, and I no longer follow her advice. See my previous post on this. I have encouraged others to write commitments to their creative life, and have often adopted others’ commitments when they have been shared in group exercises. One person’s, to read one book at a time, helped me to get through the growing pile of books started and abandoned in favour of another book. I just did this for a summer, but seem to have slipped back into my old ways. But that’s OK: it’s a commitment I can pick up at another time if the book pile begins to feel more like homework than pleasure. Manifesto: a public declaration of intentions, opinions, objectives, or motives. In addition to my commitments, I mind map writing plans and pin them to my noticeboard. I have old ones going back several years pinned behind the current one, and it’s good to sometimes look back and see what I have achieved. I refer to the current one if I feel stuck for what to work on, and it might remind me, for instance, that I have tagged draft poems in old notebooks that need to go on to the computer (I always draft by hand). The seemingly dull act of typing out the poems gets the creative juices flowing and working on screen allows me to cut and paste, change line breaks and fiddle around to my heart’s content. I also use mind maps for working with others, for instance in planning towards publication of the latest Cultured Llama book, Do It Yourself: a History of Music in Medway by Stephen H Morris. Mind maps are a great way to take notes and then share them with others (some say that mind maps are personal and can’t be understood by others). Here’s one that I prepared earlier. For those that prefer a ready-made planner, there is a great one on the Urban Writers blog. They will also send you prompts and challenges, as well as details of their urban and rural writing retreats, if you sign up to their mailing list. As someone with limited energy, I subscribe to Sustainably Creative. Michael Nobbs, an artist, blogger and tea drinker, also has a chronic illness, and offers a daily podcast, ‘One Thing a Day’, on how to move your creative life forward using small steps. He often invites members to join in online sessions, and offers tools to work without becoming exhausted. One tip I have picked up from Michael is working with a timer (mine is a mechanical one, topped by a gingerbread man). Though, I do tend to ignore the timer when it rings, it does remind me that I may be pushing myself too far. I have reset the timer twice in order to continue writing this post! So I shall bring it to a close before I get exhausted. I am adding to my writing commitments this January: I shall spend more time on my own writing than editing others’ writing. Let’s see how that goes. When is it right to write? When is it right to share? In the early years of my writing life, which began in 2000, a year into major life changes due to illness, a friend suggested that I should write about the experience. Maybe a magazine article; people might be interested. At the time I was writing poems full of self-pity and anguish. I couldn’t physically write for long, and the thought of a long article mining my pain and difficulties was beyond me. More than that, I wasn’t ready to write it. When you’re in the maelstrom it’s enough to cling on to the wreckage, to survive, without processing what’s going on and turning it into art. Some eight years into the illness, my then partner, now husband, set up a website for me, an earlier version of this one, and I started blogging about living with chronic fatigue syndrome. There was a lot reaction to the posts, not all of them welcome. Let’s just say that I am allergic to offers of miracle cures, and if one more person suggests a drop of lavender on my pillow as a cure to the sleep problems I have endured for 14 years… There were also snide comments on how I seemed to be doing a lot for someone who is supposedly ill, as if I were making it up. I don’t need to justify or explain, but whilst it may appear that I am doing a lot, I work in small chunks of time, often only 20 minutes a day, and take rest in between. When my site was updated about a year ago I decided to ditch the chronic fatigue page, to make the site more about my poetry and stories, and blogging on whatever took my fancy. Living with chronic fatigue syndrome has only come up once, when I wrote a post on living through the harder days. 14 years after my friend’s suggestion to write an article, I wrote the script for a talk I gave to Kent Writing and Wellbeing Network. A member of the group looked it over, and thought it was publishable, so I pitched it to a couple of magazines. It was taken up by Writing in Education, the journal of the National Association of Writing in Education, and published in Spring 2014. It was a time of great loss – of work, health, relationships, financially and most of all a loss of place in the world. I had defined myself by my work, particularly during the years that my marriage was not fulfilling me, and that was gone. There was a paring down of friendships. Some had liked the Maria who danced at the front when we went to gigs; they could not cope with who I had become, and neither could I cope with having lively, chatty people around me. Visits and phone calls exhausted me. My voice was weak, and even holding a phone was too tiring. One of the greatest losses was that of words. I couldn’t read for long, or watch a film without losing concentration or falling asleep. I struggled for the right words to describe things I saw – everyday words. It felt risky, particularly exposing the rifts between me, members of my family and close friends from whom I decided to separate during my illness. I took shelter in the fact that none of them were likely to read the article or hear me speak on the subject. In April 2014, I gave a talk at the Few Wise Words festival in Canterbury. The angle was how discovering writing has helped me to survive the enormous changes in my life as a result of my illness, and how, without exaggerating, writing saved my life. The audience was invited to ask questions, to share their own experiences and to engage in writing exercises. By revealing ourselves we make ourselves vulnerable, and my story liberated others to share theirs. As the talk ended, a queue formed in front of the small dais where I sat. I felt like some kind of guru as people revealed their own experiences of illness and family difficulties. The most poignant was a woman who asked if writing would help her terminally ill daughter-in-law. She had so much anger, I was told, and was struggling to express it. Sharing this kind of thing comes with responsibilities, to the people around me affected by my illness, by my decisions to separate from family and friends. If I had written too soon, I would have been full of blame, and I am not blameless. I wrote letters, told people just what I thought of them and why I didn’t want to see them. I was not tactful. I discovered that most people would prefer not to be told ‘the truth’ as I saw it. There was a time when I felt ashamed of those letters. In my defence, I was chronically sleep-deprived: 18 months of sleeping no more than 3 or 4 hours a day – it sends you crazy; you can’t tell the difference between waking and dreams; I was verging on mania. Someone who had been through mental health difficulties said to me, ‘Those letters saved your life.’ That’s probably true. I do, however, accept responsibility for the hurt they caused. Apologies were sometimes as unwelcome as the letters. For many, things are better left unsaid. I can understand that, but for me leaving things unsaid, unwritten, means illness and living an inauthentic life. But what I have learned is: you don’t have to share what you write; the act of writing is enough in itself. Back to the queue of people waiting to talk to me after the Few Wise Words event, there was a responsibility for me to listen, to empathise, but not offer advice. My way through was messy, unplanned. My way may not be another person’s way. Who knows if the terminally ill daughter-in-law would find writing helped her deal with her anger? All I could say was that writing is not for everyone, but if she did write, she might want to decide what would happen to her journal after she died. The mother-in-law could offer to do as the woman wished with it, to destroy it, if that’s what she wanted. The writer must be free to write without awareness of a reader. There is also a responsibility to myself, to be authentic in my writing, whether I share it or not, and to protect myself from others’ reactions to my story. To be empathetic, but not to listen too long and take on the emotional baggage of other people’s stories. To recognise that I need to protect my health, my limited energy, to repel those that offer miracle cures. To remember those things that help me and those things that don’t. And to keep writing.